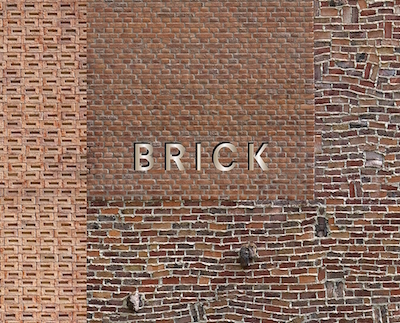 Brick, edited by William Hall, is a survey of over 150 brick buildings, from a 4,000-year-old ziggurat in Iraq to a twenty-first century structure built by a robotic arm. Published by Phaidon, it follows exactly the same format as Hall's earlier Concrete: full-page photographs with extended captions, arranged in themed chapters. In his introduction, Hall notes that "no illustrated books have been published on the subject for over a decade." The last history of brick architecture - James WP Campbell's comprehensive Brick: A World History - was indeed written around ten years earlier (in 2003). The first international survey of brick buildings - Brickwork: Architecture & Design, by Andrew Plumridge and Wim Meulenkamp - was released a decade before that (in 1993).